Thanks to Dr. Huma Siddiqui, South Texas Veterans Health Care System (USA), for contributing this case. To contribute a Case of the Week, follow the guidelines on our Case of the Week page. (1) We are looking for more cases of the week. We are also looking for a reviewer(s) for the Salivary Gland chapter, and authors with expertise in AP computer systems and LIS systems, to add content to these pages. If interested, please email NatPernick@hotmail.com. (2) Thanks to everyone who stopped by our booth at ASCP. We received many new ideas, and hope to have authors for new topics and more reviewers. (3) We posted an article on our Management Page, 2012 ICD-9 Code Changes Bring Significant Changes for Pathology / Lab Coding, by Laura Edgeworth, PSA, LLC, click here. We have also added another Coding question, about sentinel node biopsy. (4) Thanks to Jessica Wallace, PA, Bassett Medical Center, Cooperstown, NY for authoring a new chapter on Frozen Sections. 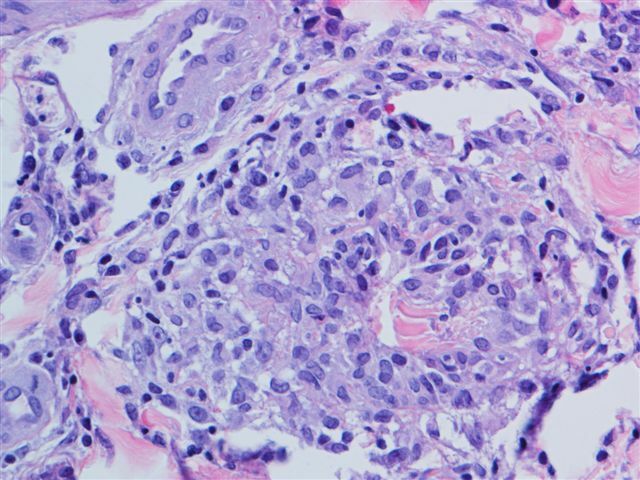 A 34 year old white woman with a history of SLE had a rash involving her trunk and extremities, which was biopsied. 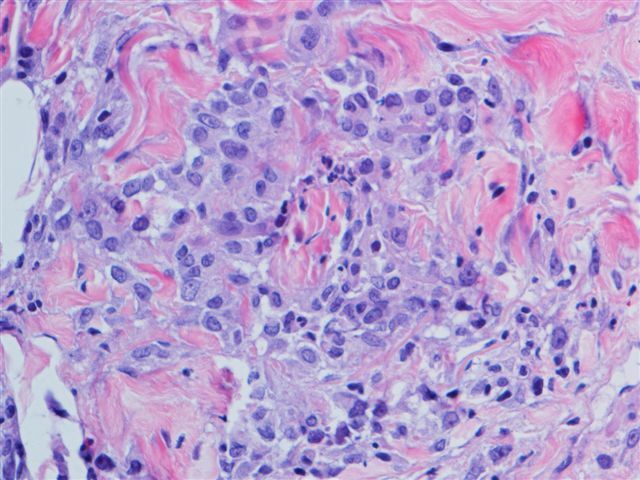 Palisaded neutrophilic and granulomatous dermatitis (PNGD) typically presents as a papular eruption on the extremities in patients with lupus erythematosus (women or men, Dermatol Online J 2003;9:1), rheumatoid arthritis or other immune complex disorders (Arch Dermatol 1994;130:1278). There often are linear inflammatory indurations on the lateral aspects of the trunk (�rope sign�). Occasionally, there is no systemic disease (Indian J Dermatol Venereol Leprol 2011;77:615). 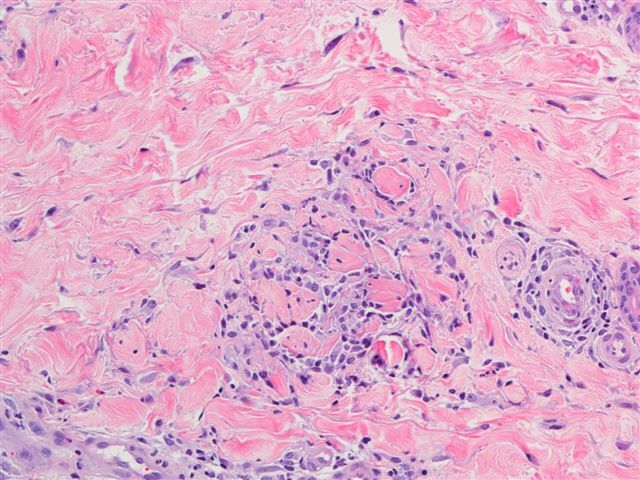 Due to a variable clnical presentation, it has been called Churg-Strauss granuloma, rheumatoid papules, superficial ulcerating rheumatoid necrobiosis and interstitital granulomatous dermatitis with arthritis. Clinically, most lesions are symmetrically distributed on the extremities, with variable numbers of lesions. 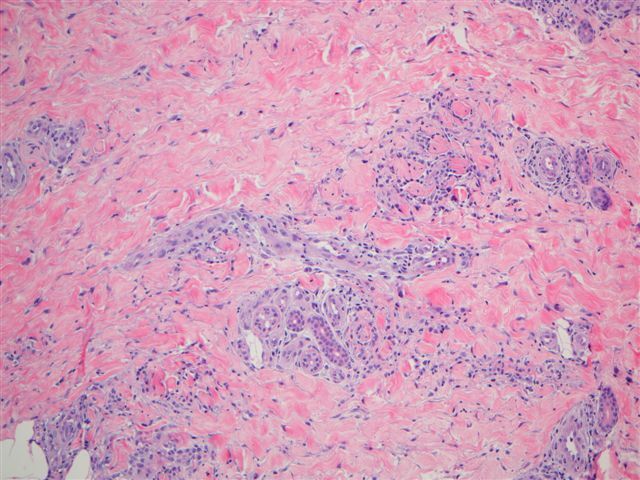 There is a spectrum of histologic changes, ranging from early leukocytoclastic vasculitis with dense neutrophilic infiltrates and degenerated collagen, to later findings of palisaded granulomas surrounding neutrophilic debris, fibrin and degenerated collagen. 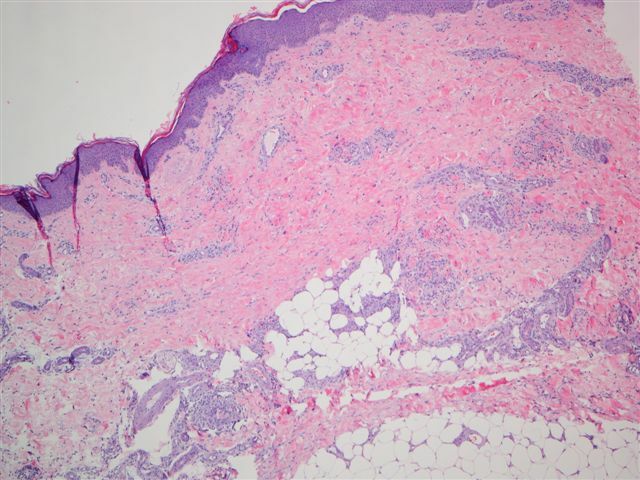 The differential diagnosis includes granulomatous drug reactions (vacuolar interface changes, often epidermotropic lymphocytes, resolves with discontinuation of drug), rheumatoid dermatosis (marked homogeneous necrobiosis with numerous giant cells and stromal fibrosis), interstitial granuloma annulare (mid dermal necrobiotic collagen surrounded by palisading histiocytes, fibroblasts and lymphocytes; variable mucin, vasculitis, foreign body giant cells) and necrotizing granulomas due to infectious organisms (PathologyOutlines.com). Treatment of the underlying collagen vascular disease may provide a good response, although recurrences are common.